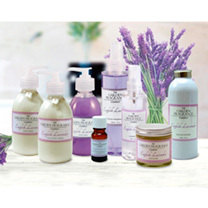 Using the finest English Lavender to create a beautiful soothing and fragrant range ideal as gifts or for personal use. UK made. Available - Hand Cream 200g, Hand & Body Lotion 200ml, Hand Wash 200ml, Angustifolia Oil 10ml, Room Fragrance 200ml, Muscle Rub 60g, Talcum Powder 100g, Slumber Gel 20g, Slumber Spray 100ml. BUY 1 OF EACH SAVE £10!